November 7th to 9th saw the 3rd Mexican National Rollerderby Championships, held this year in Queretaro. In a fit of enthusiasm I'd signed up for this without really thinking about the logistics. I've already written about what it's like to referee in a different country, but this time I would be refereeing in a different country and in a different language. Plus the affair concerning the mayor having 42 students abducted and murdered had just broken in the news and there was a small niggle in the back of the mind about just how safe a trip to Mexico would be. Either way, it was going to be exciting! The first thing I learned was that, despite using Pesos, Mexico uses the $ sign. Which meant that I had a heart attack when I was told that our taxi fare from the hotel to to the venue would be around 140$ and the hotel would be 600$ a night! I'd already paid $490 for flights and, not being one who gets paid three grand to grace a tournament, meant that I was looking at rapidly spiraling costs. Fortunately, the conversion rate is about 13 to 1 so our taxi fare was a far more reasonable $11 split between four people, with the hotel coming in at about $50 a night. This meant I could afford food after all. Hurrah. As I boarded the flight there was still quite a lot of unknowns, I didn't know what crew I was on or what position I'd be reffing but I had taken the time to learn how to count from zero to nine in Spanish. All I had to do was read the colors on the penalty board and I'd be okay for most things - it is the case that many of the Mexican skaters know English and, as I found out during the three days, if you blew a whistle and pointed at a skater they'd generally get the idea straight away and leave for a trip to the box without complaint. Which, in itself, was a refreshing change. Aside from a shaky ability to count, I was still stepping into unknown territory so I was prepared for a steep learning curve. At least we had the 6th to acclimatize and get to meet a few of the people who were going to be instrumental in the running of the tournament, notably Amanda Riccia and Alexandro Villalobos as well as the other travelling ref crew, led by Married Juana and Juana Martini. What this did prepare me for was the concept of what ended being called Mexitime - everything in theory had a notional time when it would happen but, just like the Pirates Code, it was more of a guideline than a rule although somehow everything always ended up working out and each day finished on time. What it didn't prepare me for was the fact that Queretaro is about 6,000 feet above sea level which meant that I was horribly dehydrated for the first night and day and had to dig deep into my energy reserves to be able to ref three or four games a day. Suffice to say I drank a lot of liquids. 1) Most of the teams were short rostered - one team had as few as 8 skaters, with the largest bringing, I think, 19. I was worried that this meant there would be lots of forfeits and also made me vaguely concerned about how high the level of skating would be, were these teams bringing everyone they had regardless of skill level? It turned out to be more of a time/money thing, many people just either couldn't get time off work or afford the trip. It turned out there was only one forfeit (although some games it came very close) and I needn't have worried about their skating skills - their derby knowledge was actually impressively high. 2) Most of the skaters were small. There were teams whose tallest skater was 5' 7" with nobody over 5' 10'. Which, being a sprightly 5' 7" myself made it much easier to be seen by the infield refs when OPRing. It also meant I'd be more likely to appear in the background of tournament photos which pleased my ego! 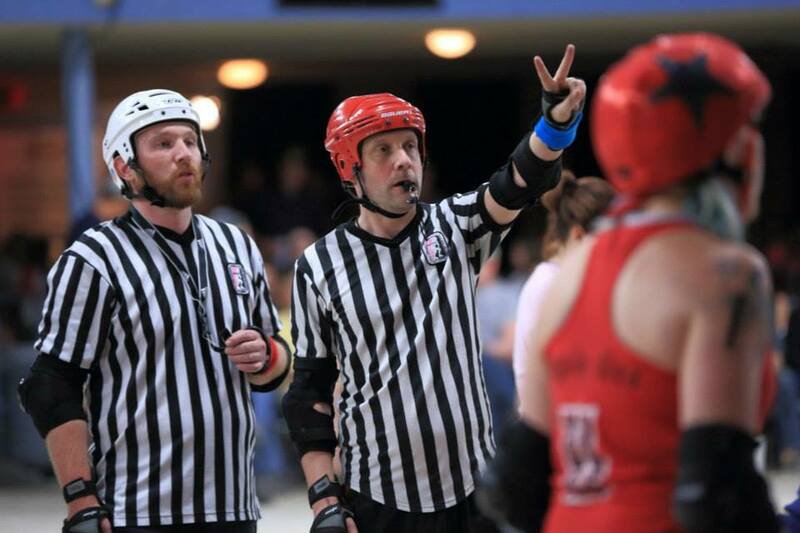 More importantly it helped with my refereeing because there were times when my Spanish morphed into French, German and once even Russian, trying to call color and number. Being able to communicate to the inside to have the Mexican (or fluent Spanish speaking American) referees to then relay the penalties made everything much easier. (As an aside, I found that having to think about what the words were for the color and number I would be calling made me slow my penalty calls down without having any effect on game play. It actually felt better to have that little pause between seeing the penalty and then calling it and is something that I have used to adjust my refereeing since as it certainly helps with clarity. 3) The skaters were young. A WFTDA survey a couple of years ago said that the average age of derby players was 31; here it was probably closer to 23 which, to me, says that even if derby is on the wane in the US it's definitely a rising phenomenon in Latin/South America and that many of the skaters I saw play are destined for long and distinguished careers. While I was pleasantly surprised by the game play and skill of the women, it was the men that really made the biggest impression. Of the four teams I saw playing, I would say that three of them are good enough to make the MRDA top 8. To say they play smash mouth derby is an understatement; most of the guys are roller hockey players and have absolutely no fear about turning to face a bull rushing jammer and all had excellent conditioning. They literally played from the start to the final whistle at 100%, no quarter asked or received and all this with only one injury - and even he got up to play later on in his game after having his chest wrapped to a degree that would make the Michelin man jealous. I'm not going to go into detail about all the games, I'll let the individual leagues do that, but I want to say congratulations to Monterrey for retaining their national title in a hard fought game against Quimeras LRRDF and Minotauros LRRDF for their victory over MRDX Disorder in the men's final. I don't know if there is a Mexican men's national team, but if there is - from what I saw at that one tournament - I would be putting heavy money on them making some big upsets at the Men's World Cup that's just been announced as being July 14-17th 2015 in Calgary. I genuinely could see them pulling silver, they are that good. As for the women's team, well with the women's world cup being so close I'm not going to give anything away and just say watch and enjoy. This was their third national championships and it was a huge success, and I'd definitely recommend considering applying for the tournament next year. But the most important thing I learned from this was something quite different. And that was... make sure you fully check your bag before you take it abroad. That way you get to avoid the curious looks of customs officers when they pull three unused tampons out of your backpack. Ay caramba! Someone make up a dance move for me!